Earlier in May, I posted about one of what I called 'troublesome privacy spots' in our new backyard. 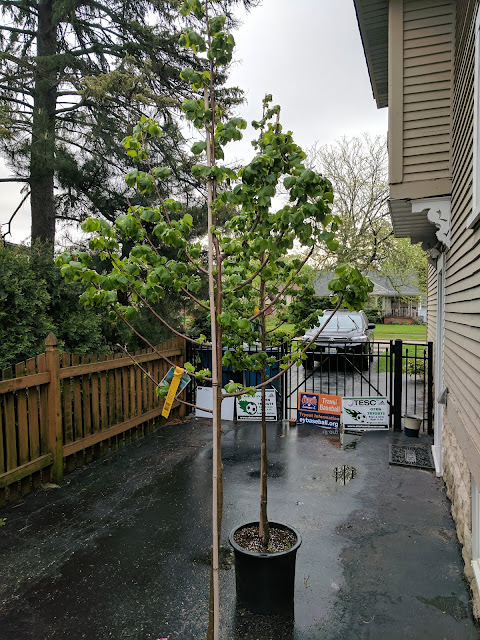 This post, covers what I think will be the solution to the other one of those 'troublesome privacy spots' - this time being on the south side of our lot close to our neighbor's patio. We're looking into fences and will likely get a 6' privacy fence close to the house, tapering down to a four-foot fence for the balance of the yard, but I'm also taking this opportunity to try something I've wanted to for a while: espalier'ing a pair of trees. Don't know what an espalier tree is? Here's a post that chronicles the history of the practice that is worth reading, but in a nutshell it is the intersection of the science of how things grow with the art of gardening. You trim and train trees to be just two-dimensional objects. That's espalier. At our previous place, our landscape architect spec'd an espaliered fruit tree along our fence on one side and along the house in our garden. You can see that called out in this post from May of 2012, when I showed of a portion of the landscape plan. It is on the left side, in the garden, behind the existing fence. I had never heard of the term, so I poked around and then, sure enough, I started to see the concept pop up all over the place - in magazine articles about gardening and in various blog posts showing the various designs. Some people call them 'living fences' and they're perfect for narrow, shallow places, so thinking about them up against a building or - how I'm thinking about them - against a fence near the property line is appropriate. 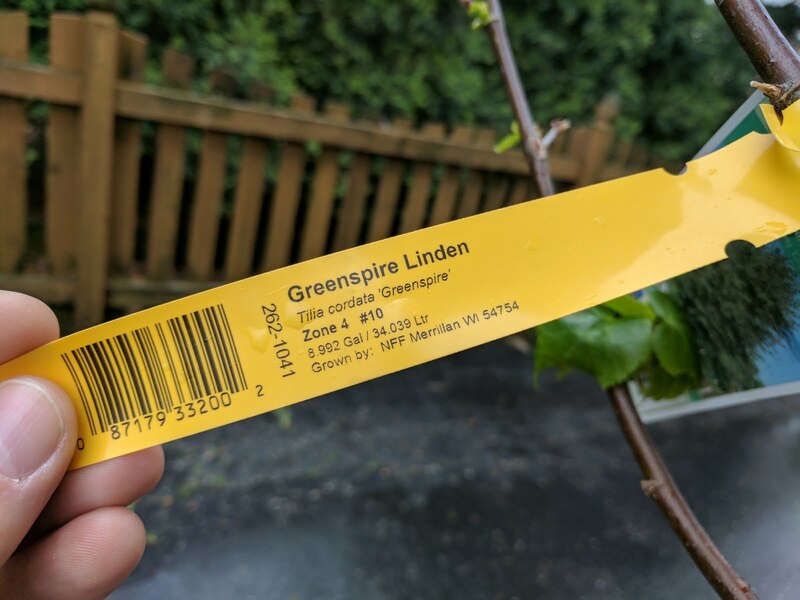 I went out on the web to see what kind of trees can support being espalier'd and came back with answers that people mostly craft them with fruit trees, but I also came across this post that shows and talks about espalier'd Linden trees. And that got me hunting. For a deal on some young Lindens. 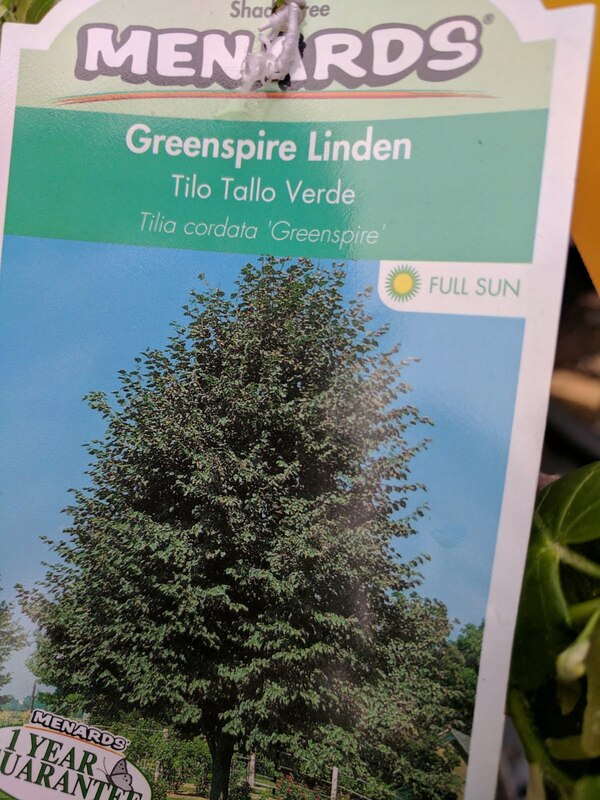 So, imagine my delight when I found some good-sized (in 10 gallon pots) Greenspire Lindens at - you guessed it - my favorite place: Menards. I picked out two specimens and packed them into the back of the van, hoping not to crack any branches or limbs. When I got them home, I got busy trimming then to be two-dimensional. And the photo at the top shows the end result. If you look closely, you'll see that the tree has a vase-like shape, but that there are only branches coming out of the main trunk that go to the left and the right. If I turned that pot 45 degrees, you'd see a two-dimensional tree! We're on our way! Pruning the young Lindens to be just two-dimensional was the easy part. The harder part comes with training them to the shape I want. Turns out, there's both an informal espalier - which means just a tree that has been pruned to be mostly flat, with branches going in various directions and a full-face. Then there's the more formal espalier, which takes the shape of specific forms like a candelabra or fan or diamond. You can see some of the various shapes if you go here to this post and scroll down. This is my first shot at espalier, so I'm thinking that I'm going to try a formal shape, knowing that if it gets too difficult to maintain or doesn't work so well, I can abandon that formal shaping and allow the Lindens' to go more informal in their face. The trick to having a formal look, however, is the frame that you must install and the wires that you must utilize to train the trees. In order to do that, I have to first figure out and then build out the frame that I'm going to use, then string the necessary wire across that the right lengths and heights. I found this frame schematic that utilizes some heavy cedar timbers that right now is the front runner - it includes a top cedar member which I'm not sure is applicable for this as these trees are going to be taller than any frame I can build, right? Of course, I can't do that until we get the landscaping work done with the final grade being secured and the sod installed and established. Until then, these two beauties will sit on the driveway in Elmhurst nursing off the groundwater that the sump pump is ejecting everyday. I consider that a win in terms of conservation, right? Hopefully soon, we'll have a chance to get these in the ground followed by the frame being installed.